Researchers in the Functional Orthopedic Research Center of Excellence (FORCE) Lab compared the biomechanics associated with “maximal” and “neutral” running shoes in tests with 15 female runners. The study concluded that runners experienced a higher impact peak and increased loading rate with the “maximal” shoes. Increases in both factors are associated with a greater likelihood of injury, such as plantar fasciitis and tibial stress fractures. In the FORCE Lab study, researchers evaluated the impacts on runners’ feet and legs before and after a simulated 5,000 meter (about 3 miles) run on a treadmill. Each subject wore a neutral running shoe (New Balance 880) for one test and then, after a seven to 10-day waiting period, repeated the procedure with a maximal shoe (Hoke One One Bondi 4). In each test, 3D movements and forces were measured by monitoring reflective markers placed on the runners’ shoes and legs and by having the subjects run over a “force plate” that recorded the forces being applied as the runner’s foot hit the surface. 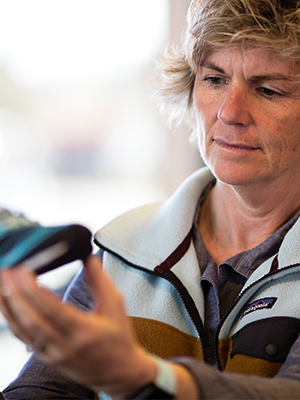 The research is a first step in gathering evidence on the effects of maximal running shoes on runners’ injury risks, said Pollard, who is also a licensed physical therapist. Maximal shoes are becoming very popular, but without controlled studies, clinicians have been unable to make science-based recommendations to runners. Pollard said she expects that a study with male runners might produce different results. “We know that gender differences in running biomechanics do exist,” she added. Funds for the study came from Oregon State University-Cascades. The FORCE Lab specializes in studies aimed at preventing injuries to athletes. It is a partnership between OSU-Cascades, Therapeutic Associates-Bend Physical Therapy, The Center for Orthopedic and Neurosurgical Care and Research and The Center Foundation.